Several California State Parks are looking to hire seasonal workers, including park aides, camp hosts and actors. 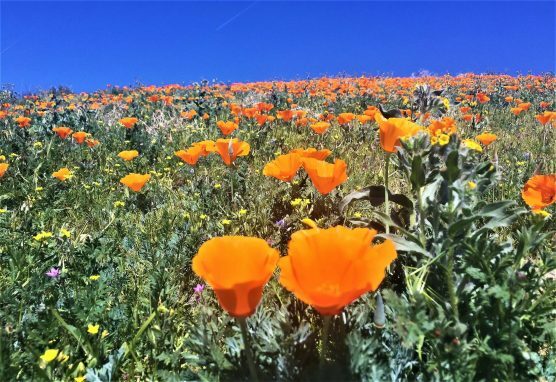 Tehachapi District is seeking to hire six to seven Visitor Services Park Aides for the 2019 spring Antelope Valley poppy season. The reporting location is the Antelope Valley CA Poppy Reserve at 15101 Lancaster Road, Lancaster CA 93536 (16 miles east of Hwy 14). These positions will work under the direction of the Museum Curator. The visitor services park aide duties will include operating the entrance station at the Antelope Valley CA Poppy Reserve, cleaning inside and outside surrounding facilities, collection of park fees, and completing end-of-day cash register accounting and associated collections paperwork. These positions are a primary point of contact for park visitors and will provide information on the park(s), explain park rules, and give directions to park facilities, surrounding area features and establishments. Reporting of park issues and problems to lead staff is required. Basic reading, writing and math skills are a must. Ability to speak English at a level required for successful job performance. Reliable transportation is essential due to the remote work location as well as a valid class C driver’s license. This is a uniformed position and the successful candidate will be required to purchase and wear a State Parks uniform, and must complete and pass a DOJ live scan. These positions are seasonal with an approximate start date of March 1, 2019. For further information regarding this position, please contact Peggy Ronning at (661) 946-6900 or peggy.ronning@parks.ca.gov. Tehachapi District is seeking to hire two to four Park Maintenance Aides for the 2019 spring Antelope Valley poppy season. The reporting location is the Antelope Valley CA Poppy Reserve at 15101 Lancaster Road, Lancaster (16 miles east of Hwy 14). These positions will work under the direction of the District Maintenance Chief. The park maintenance aides perform routine housekeeping and maintenance of facilities and grounds at the Antelope Valley CA Poppy Reserve. Duties include litter and garbage collection and disposal; cleaning and maintaining picnic areas, restrooms, offices, and visitor centers; and assisting with basic plumbing, electrical, carpentry, painting, vandalism repairs, road and trail maintenance, and fence repairs. Duties include greeting visitors and campers, selling firewood, light grounds maintenance, light restroom cleaning, and opening/closing gates. It’s a small campground in a quiet park, but spring may be busy if we have a good wildflower bloom. Daily work hours depend on park visitation (but generally about 5 hours a day), and days off are during the week but flexible. Camp hosts can also be trained to give interpretive programs if interested. A small town and the main park offices are located only 4 miles away. The 3-6 month position is available immediately. This is not a paying position, but hosts are compensated with a free campsite and hookups. Camp hosts must provide their own trailer or RV, and pass a background check. More info about the position and the park can be found at http://www.parks.ca.gov/?page_id=24561. Email Kevin.Overduin@parks.ca.gov for questions or to receive an application packet. If you are between the ages of 8 and 18 and enjoy acting, come out to Antelope Valley Indian Museum State Historic Park and audition for our annual outdoor play based on a traditional California Indian story. Rehearsals will be every Tuesday afternoon from 4 p.m. to 5 p.m. starting on Tuesday, February 19. Auditions will be on the first day of rehearsal. The performance will be the evening of Saturday, May 4. For more information, call the museum at (661) 946-3055 (711 TTY relay service), or visit our website at www.avim.parks.ca.gov. WHEN: Auditions on Feb. 19, 2019. Rehearsals: Tuesdays from Feb. 19 through April 30, 2019 from 4 p.m. to 5 p.m. DIRECTIONS: From the 14 Freeway in Lancaster, go east on Avenue K to 150th Street East. Turn right and go south for two miles to Avenue M. Turn left and go east on Avenue M for one mile to the museum. California State Parks is currently taking reservations for the spring tour season at Tomo-Kahni State Historic Park in Tehachapi. Visitation is only permitted on a guided tour, which involves a moderately strenuous 3-hour hike. Although no structures remain on this Kawaiisu (Nüwa) Native American village site, the area’s rich history comes alive through the trained volunteer tour guides and the clues that the inhabitants left behind. Tomo Kahni means “winter home” in Kawaiisu, and rock rings mark the locations of many of the kahni, or homes, that were built of juniper boughs. Hundreds of mortar holes in the park tell of a very active past. The tour also includes Medicine Cave, Nettle Springs and a cave with pictographs- a sacred place of the Kawaiisu. Spring tours will be offered Saturdays April 27th – June 8th. Activities begin at 8:30 a.m. with an orientation at the Tehachapi Museum in Tehachapi and last approximately 4 hours, including travel time to and from the park (transportation is not provided). Please note: This tour is not safe for those with heart conditions, breathing problems or walking limitations. Weather at the high-elevation park is variable, so layered clothing is recommended. Ample drinking water, sun protection, and sturdy walking shoes are also necessary. Tour fee is $5 for adults and $3 for children ages 6-16 (age 5 and under are free, but not recommended on tours). Tours are limited to 12 people and fill up fast so reservations are highly recommended for an additional fee of $10 per party. To make a reservation or for more information, call (661) 946-6092 or email Mojave.Sector@parks.ca.gov. When: Saturdays April 27th – June 8th, 8:30 a.m. – approximately 1 p.m.